Falling in love with Barcelona was one of the easiest things I’ve ever done. Finding a more loveable city would be the ultimate challenge, so Barcelona isn’t going to lose the title of my favourite place anytime soon. I try to visit at least once a year: a year without Barcelona wouldn’t just simply feel right. The last time I was exploring Gaudi’s city was in December 2016. I wanted to finish a year with a big splash, and nothing screams “eventful” more than Barcelona. My parents agree, so we said yes to “fun” and took a plane straight to Spain. I was there for about two weeks: Christmas and New Year’s Eve included, and just as expected, these were some of the nicest weeks of 2016. 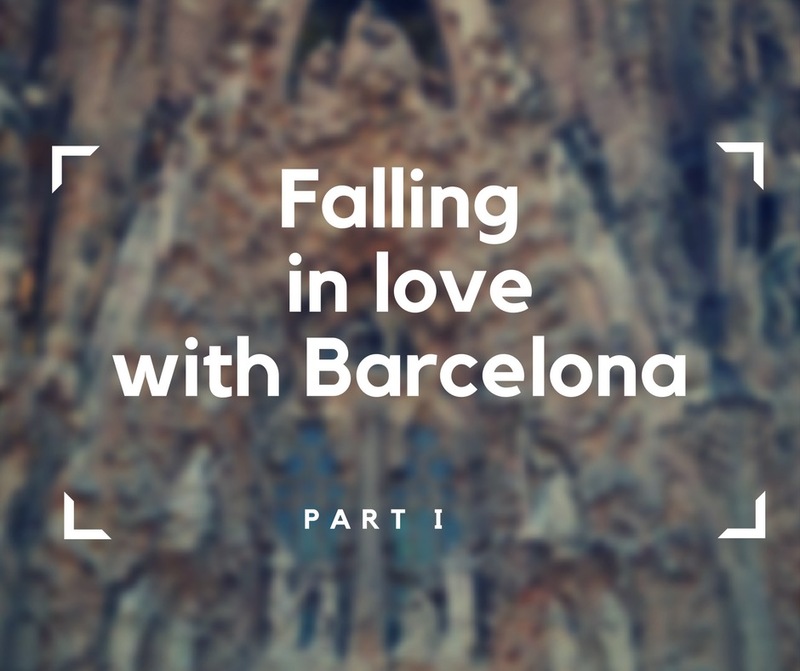 What to see, what to do, and how to fall in love with Barcelona? More about it below! Montjuïc is the name of the hill that is perhaps the best point view on Barcelona. What’s interesting – its name comes from Medieval Catalan (Catalan, along with Spanish, is the official language of Catalonia – the region Barcelona is in) and is translated to “Jew Mountain”. I really love the place, and a great view of the city is just one of the reasons. The National Palace, one of the most beautiful buildings in Barcelona, is located there and that’s definitely a place worth visiting. For all art lovers, I have good news: it’s home to The National Art Museum of Catalonia. Beautiful both inside and out! Botanic Gardens of Barcelona are truly wonderful places. Most of them are located in Montjuïc, and they definitely make it to a must-visit list. It’s easy to get lost in their greenness, relax and take a break from a hectic rhythm of the city. I’ve been there many times, and it’s never been boring. Exploring gardens on Blumil was a pure pleasure since it was designed to get off the beaten track, and it can handle various types of terrain. Big yes for Botanic Gardens – both from me and my Blumil wheelchair! I know at this point Gaudi’s works seem almost a cliché, but let’s give the credit where it’s due. The abundance of details the Sagrada Familia presents is outstanding, and let me remind you it hasn’t been even finished yet. Aside from Sagrada, it’s worth to mention Casa Batllo, Casa Milà and Park Guell. They are the core of Barcelona’s heart, places to be seen, even if only once in life. Fun fact: when I visited The Sagrada Familia with Coco, we quickly became almost as popular as stained glass windows! I didn’t take hundreds of photos this time around, but I and Coco might actually have so many photos from there… just not on my phone! Tibidabo is a definition of fun, and history mixed together and I definitely enjoyed my time there. It’s one of the oldest amusement parks in the world, and the entire complex is full of different facilities, making it impossible to be bored there. It’s definitely a good alternative for those tired of sightseeing. Against the popular opinion, Tibidabo is for all ages, so don’t let any misconceptions stand between you and the promise of fun. My vote goes for Tibidabo! Hotels in Barcelona are definitely among the most accessible in the world. The city’s generally well prepared to cater for needs of wheelchair users, so the range of prices for accessible hotels is wide, and the standard is high. 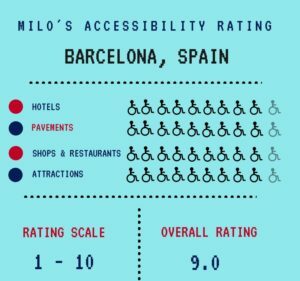 Ramps, great elevators, even pavement – these things are seen as rather obvious in Barcelona when the word “accessibility” is mentioned. The city’s not free from small flaws, but nobody’s perfect, and Barcelona’s already almost, almost there. Accessing attractions wasn’t a problem in Barcelona. 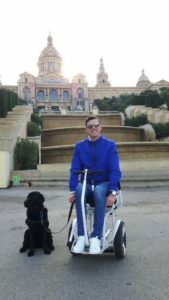 The city council is actively working on accessibility of the city, and I must admit I didn’t stumble upon many touristic attractions that weren’t even slightly adjusted to wheelchair users’ needs. I wish other European metropolies were following Barcelona’s footsteps. 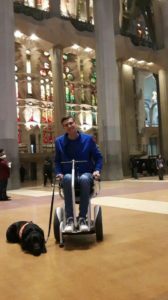 All in all, Barcelona’s definitely one of the most accessible cities I’ve visited. It has its flaws, but nothing that couldn’t be overlooked in the light of its wonderfulness. Exploring the city on the wheelchair is not a dangerous mission like exploring Prague, the standard of hotels is satisfying, attractions are top-notch and accessible at the same time (it’s still rare!) and pavements there are not mortal enemies to wheelchairs. There is always something new to discover in Barcelona. The city is constantly changing and reinventing itself, but it never quite loses its charm. Every time I think I know it by heart, I stumble upon a new street, a new restaurant or a new taste and I’m proven wrong. Barcelona’s full of surprises, and I keep coming back to discover them all. More about it in Part II!